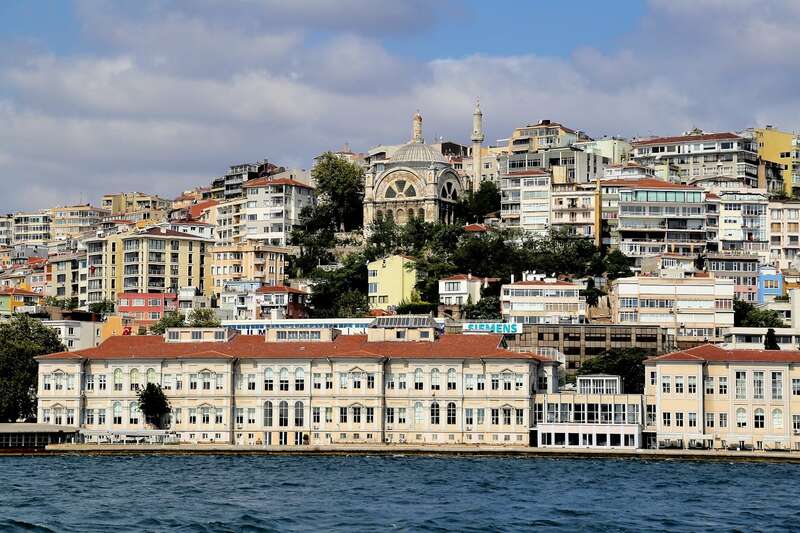 Doing a Bosphorus cruise was high up on our shortlist of things to do in Istanbul. 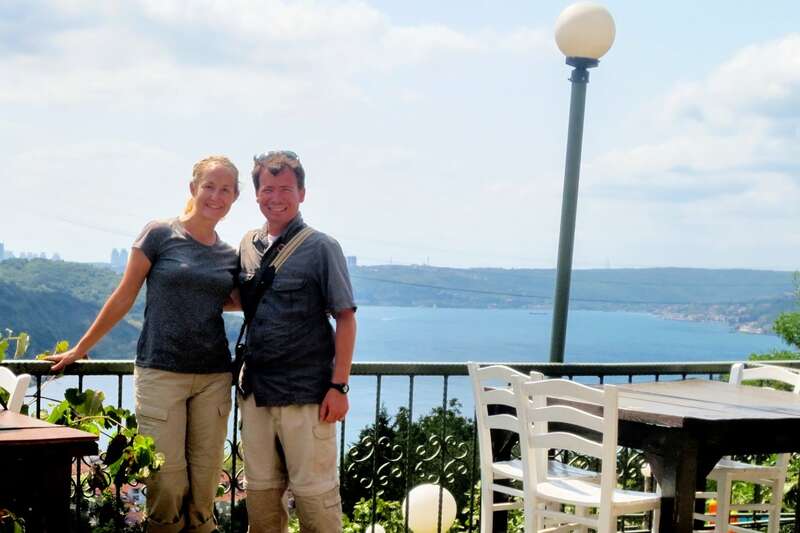 Traveling on a budget, however, we held off on it until our very last full day in Turkey. 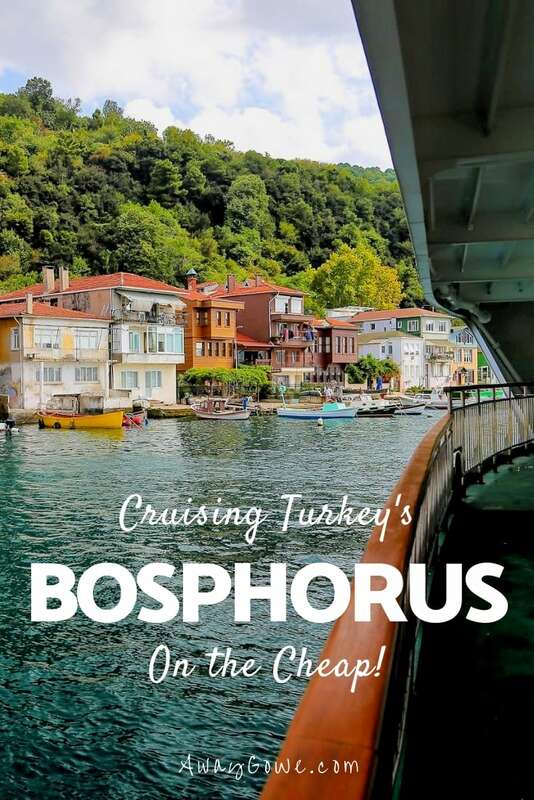 Thankfully, taking a six-hour cruise trip on this legendary waterway separating Europe and Asia was far cheaper than we thought, and the process was relatively painless. 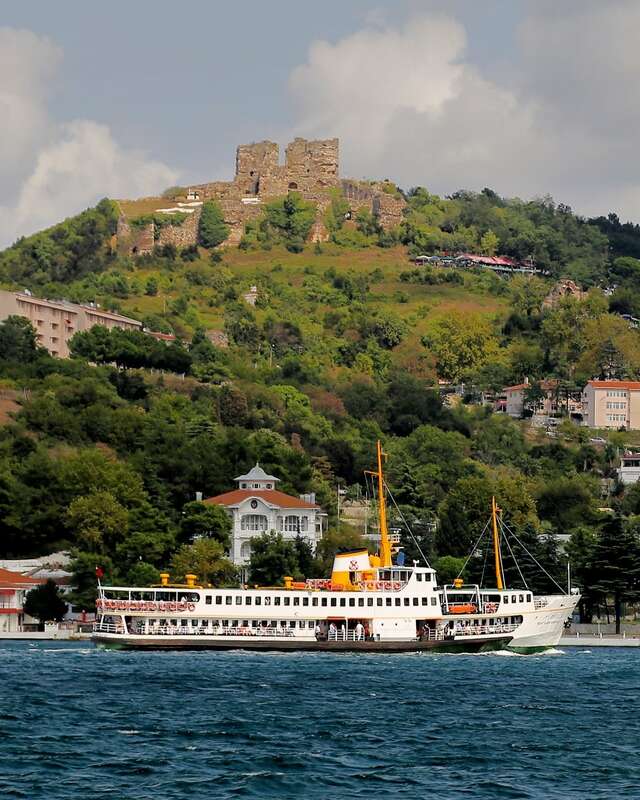 In retrospect, our Bosphorus cruise was one of the highlights of our time in Istanbul. 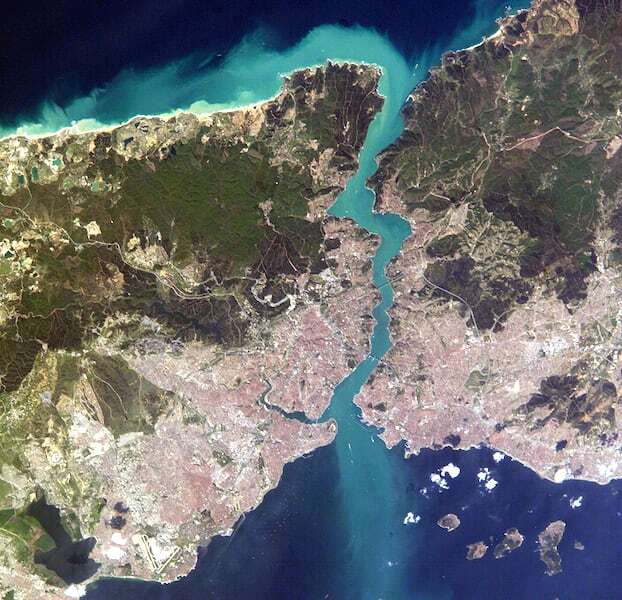 This satellite image taken from the ISS in April 2004 also shows most of the city of Istanbul (the reddish part). 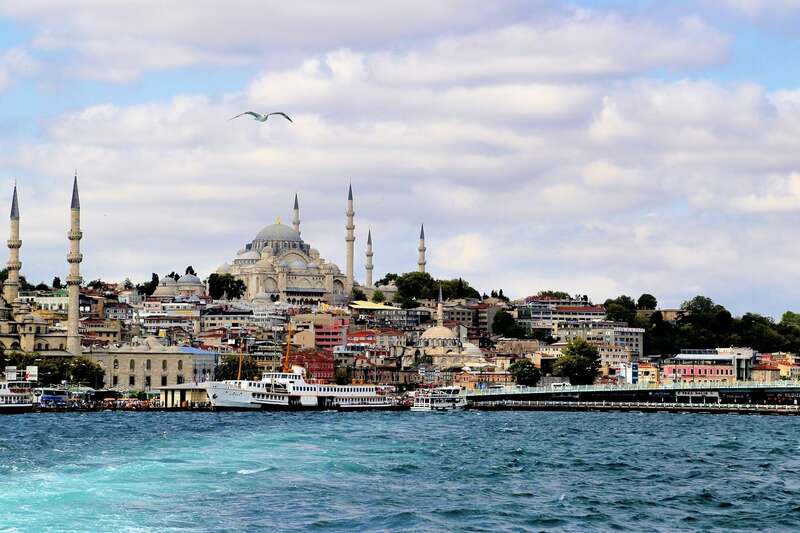 The Bosphorus is the waterway separating the European and Asian sides of the sprawling city of Istanbul. 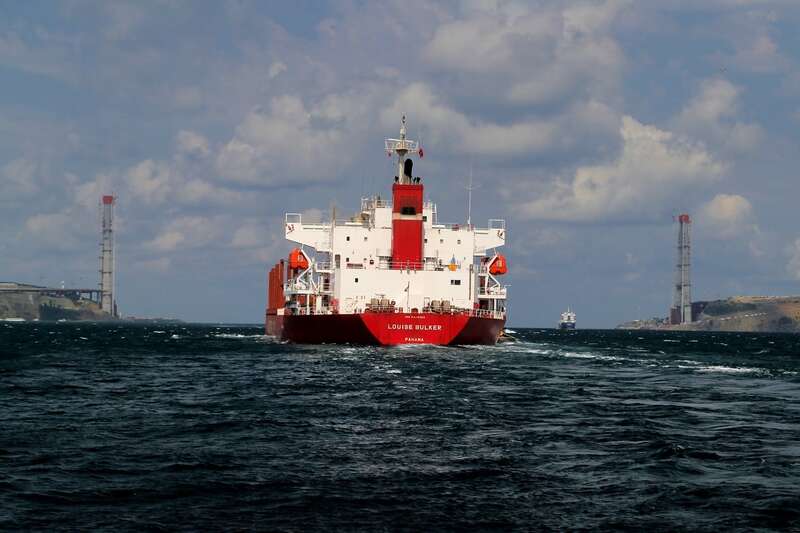 The strait stretches 17 nautical miles from the Sea of Marmara in the south, to the Black Sea in the north. 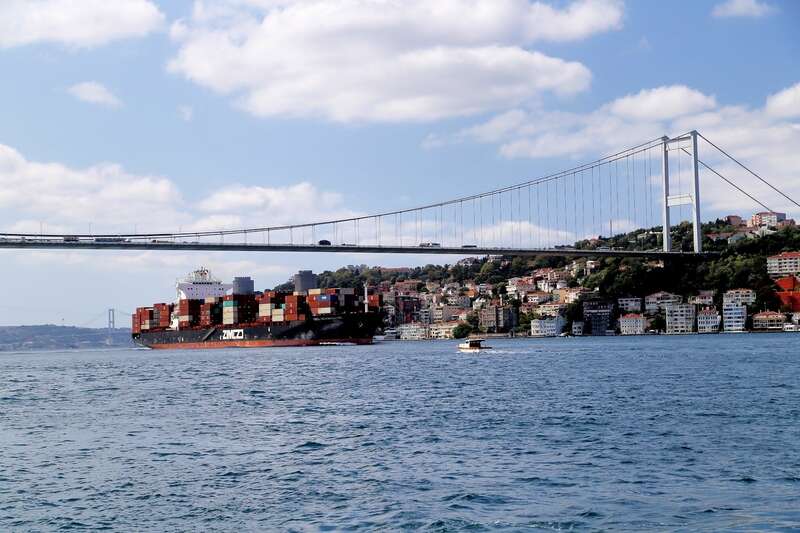 There are two bridges over the Bosphorus connecting the two continents of Europe and Asia, with a third bridge under construction at the most of the Black Sea. 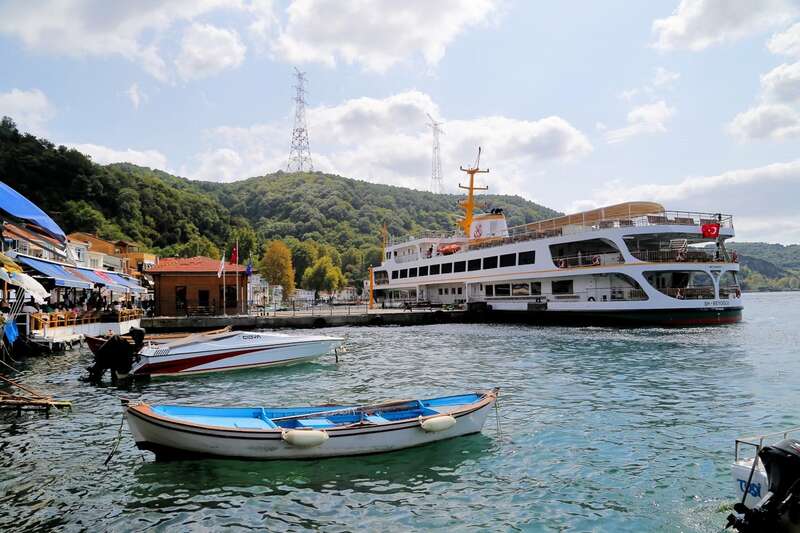 There are certainly a number of swankier options for exploring the waterway, but we opted for the excellent public ferry (Sehir Hatlari Bosphorus cruise), which set us back US$11 each. And we were very pleased with the results. 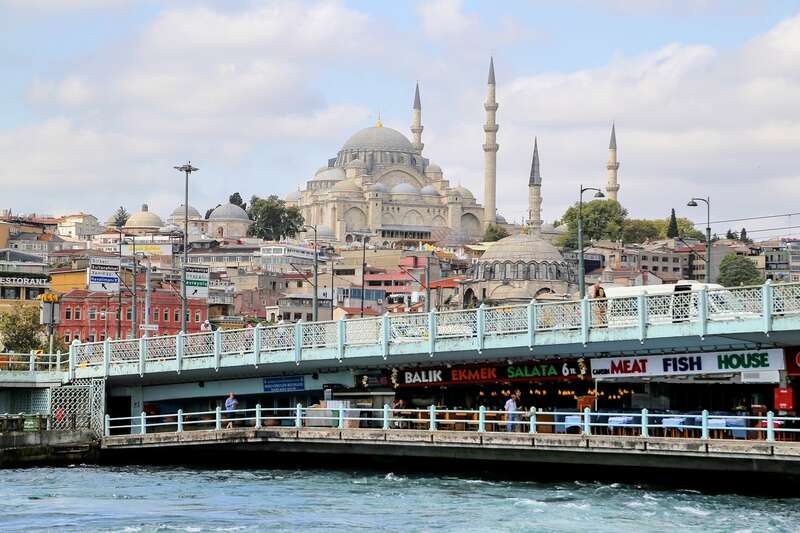 To take the Sehir Hatlari public ferry, head to the Galata bridge. From the Eminonu (Old City) side, don’t cross the bridge, but walk to the right of it and follow the signs for Sehir Hatlari. The office is adjacent to the Red Hop-on Hop-off Bus ticket office. We heard that the ticket office opened at 10am. We arrived 30 minutes beforehand and there was already a line. They opened a bit early and we managed to snag a window seat on the port-side since the ferry hugs the left-hand shore (Europe on the way out, and Asia for most of the return trip). However, we quickly realized the outside benches at the stern of the ferry might just be the best seats on the boat on a nice day, which is where we ultimately ended up. There were two ferry options, Full Circle (US$11) and Short Circle (US$5). We opted for the Full Circle, which takes about six hours round trip with a few hours in the middle to enjoy the northernmost stop. 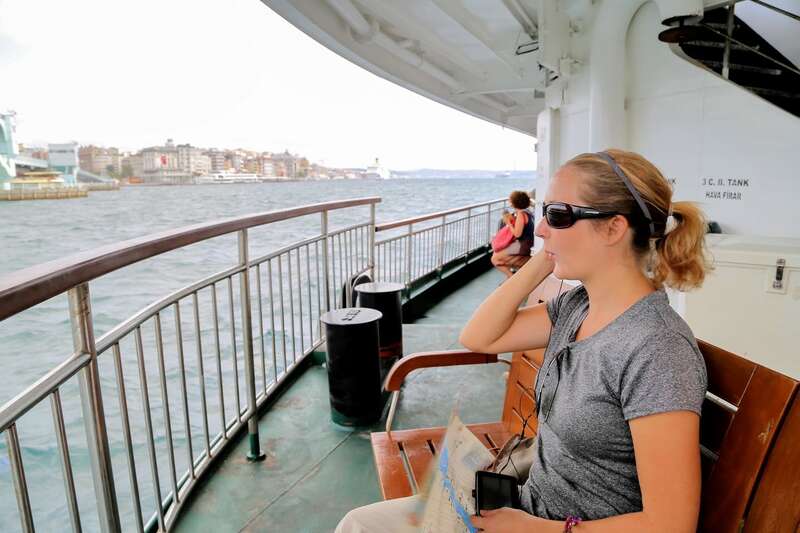 For comparison, other cruise options (not public ferries) will run as much as US$70! The boat has a small snack bar and restrooms, but a lot of passengers brought on their own snacks. 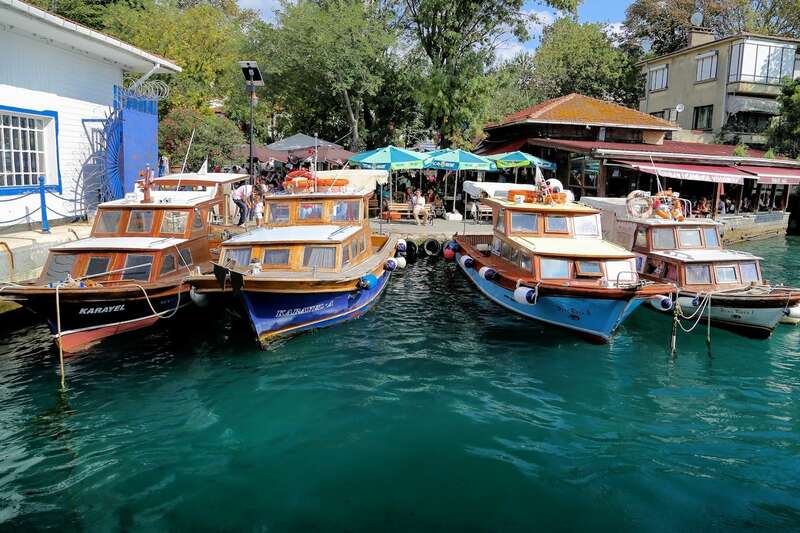 There are a number of good restaurants, shops, and other amenities at the turn-around point, Anadolu Kavagi, for those who are taking the Full Circle cruise. HOT TIP: Be sure to grab an audio guide at the ticket booth when you buy your tickets. It adds excellent context to the cruise and tells you a bit about the many highlights along the route. 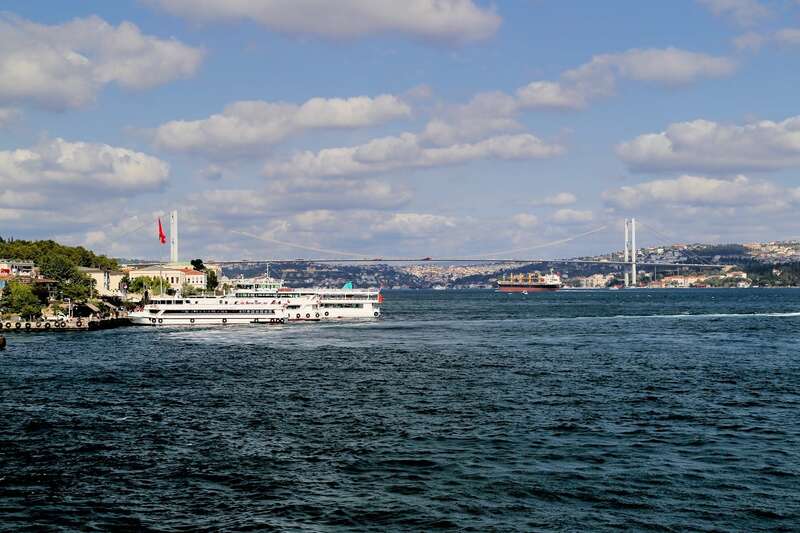 The ferry left Eminonu on the Golden Horn, right in the heart of the city (take note of the restaurants under the bridge — one of Eminonu’s popular attractions). 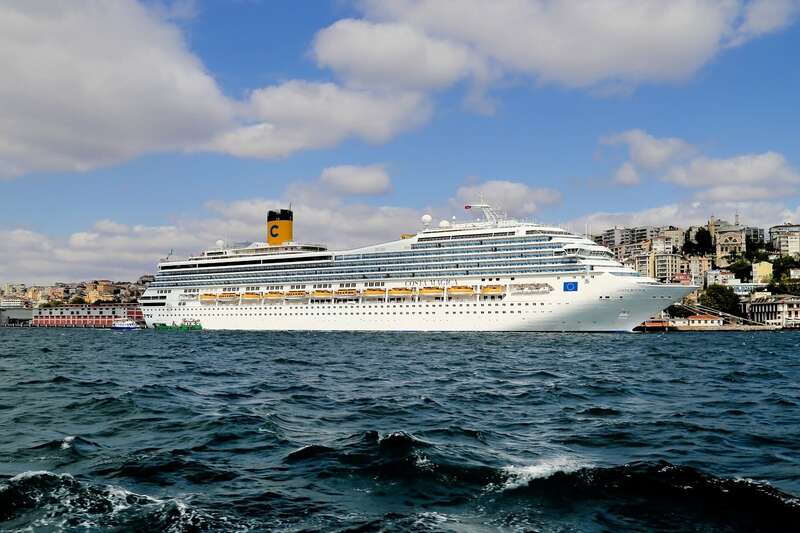 The Costa Magica, sister ship to the ill-fated Costa Concordia. Leaving the Old City, the ferry passed a number of historic sights and points of interest. As mentioned about, Lori and I rented an audio guide that was available at the ticket booth, which gave information about various points of interest along the way. 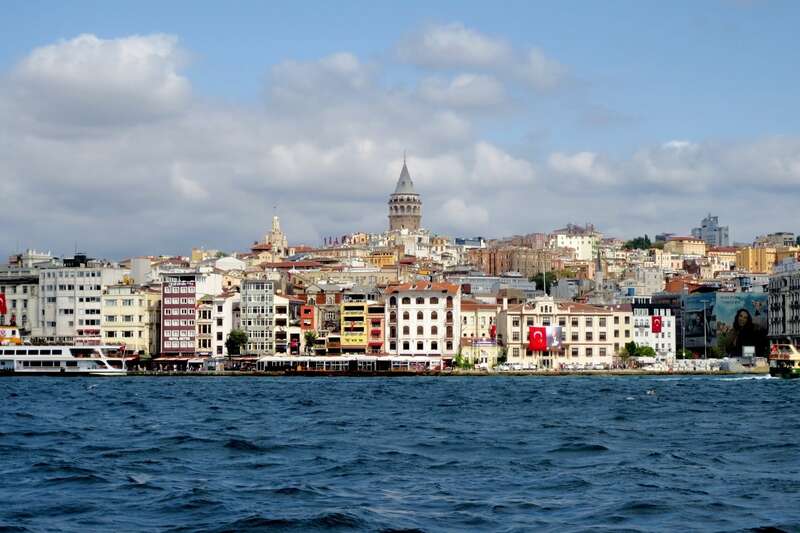 Galata, and the Galata Tower. Dolmabahçe Mosque, an Ottoman Mosque completed in 1853. 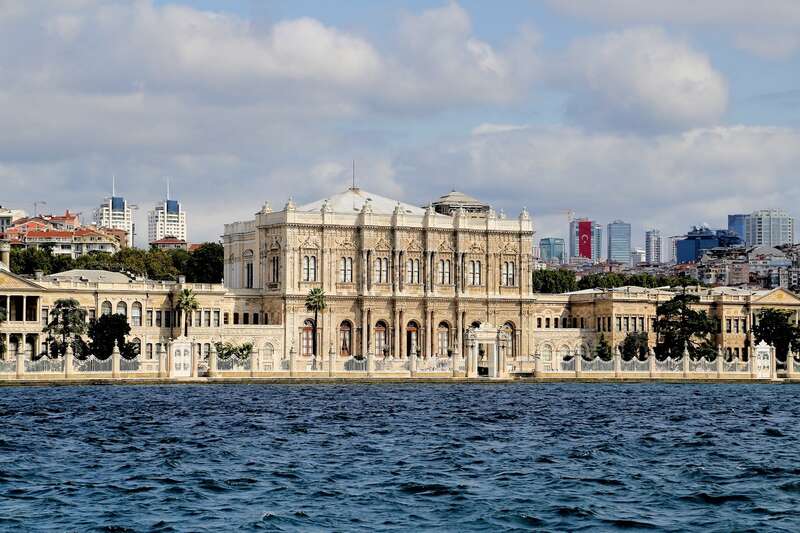 Dolmabahçe Palace (Sultan’s Palace), now a museum. 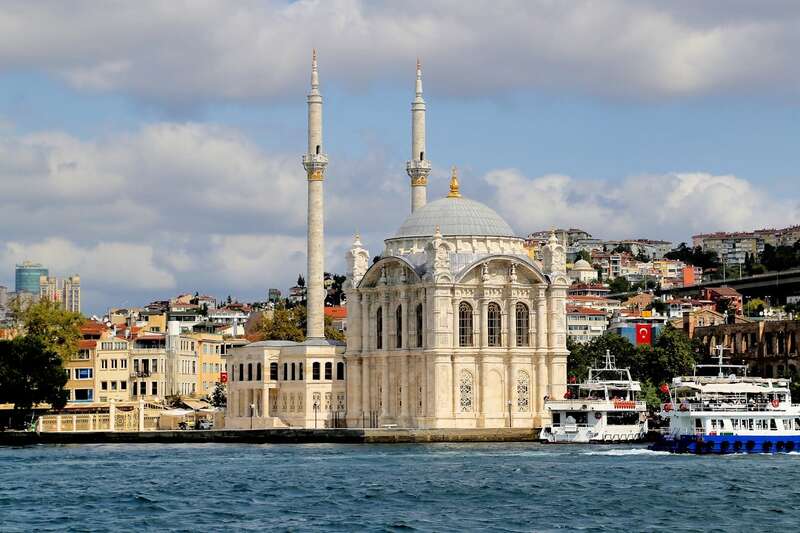 Ortaköy Mosque, built in 1856. 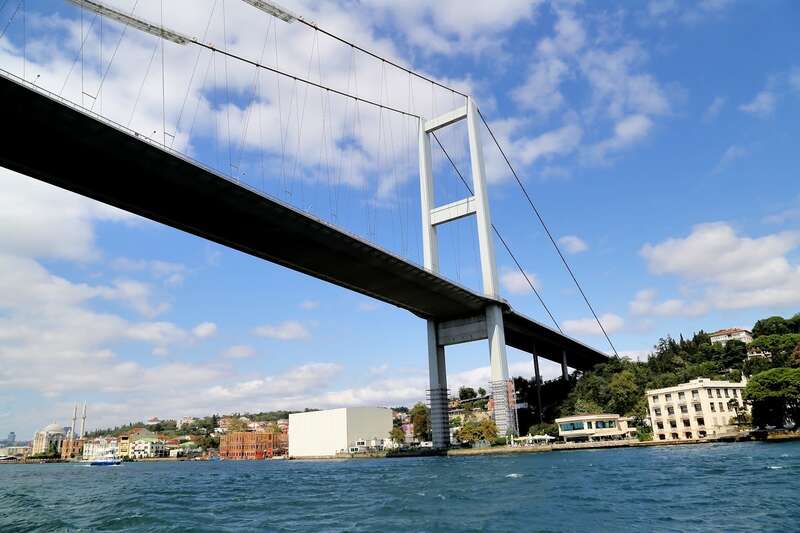 The First Bosphorus Bridge was built in 1970, and as the name might imply, was the first bridge to connect Europe and Asia. 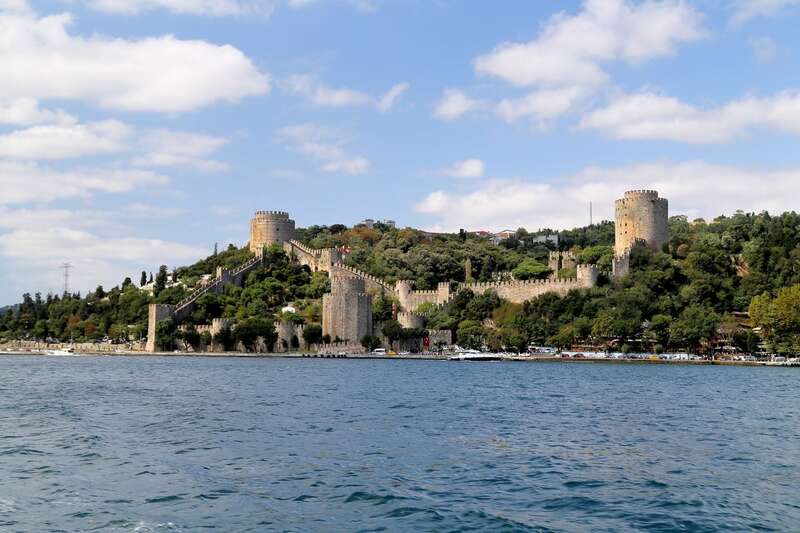 Rumeli Fortress, built by the Ottomans in 1452. 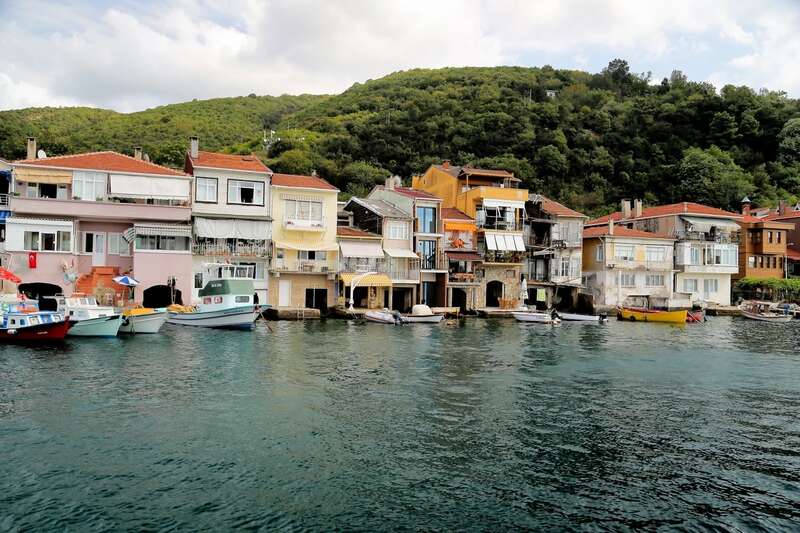 After about 90 minutes on the water, with a few stops in between, we reached the last stop before turning back for Istanbul: the village of Anadolu Kavagi. Our ferry docked here for a few hours — more than enough time to grab lunch, do a little hike, and poke around the village. 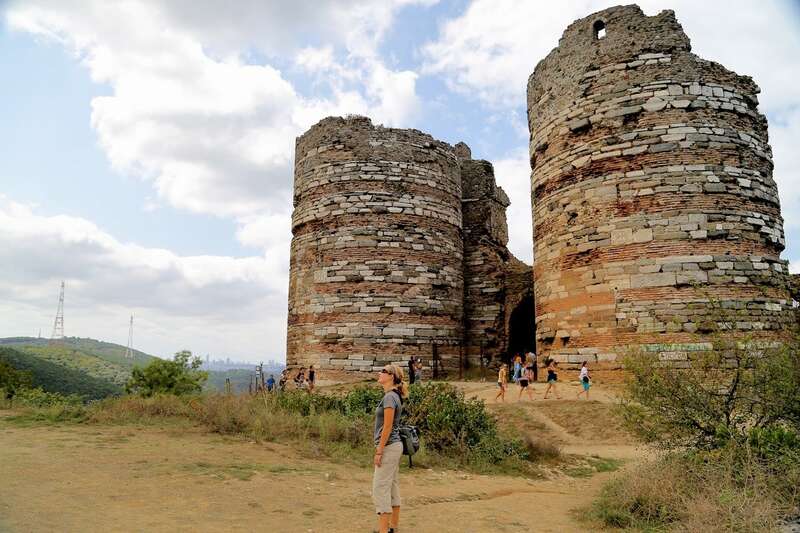 From the ferry pier, you can hike up to a Yoros Kalesi (Yoros Fort), a small fortification with a commanding view of the Bosphorus and the shores of the Black Sea. Looking north, we could see the construction of a third bridge spanning Europe and Asia currently under construction. 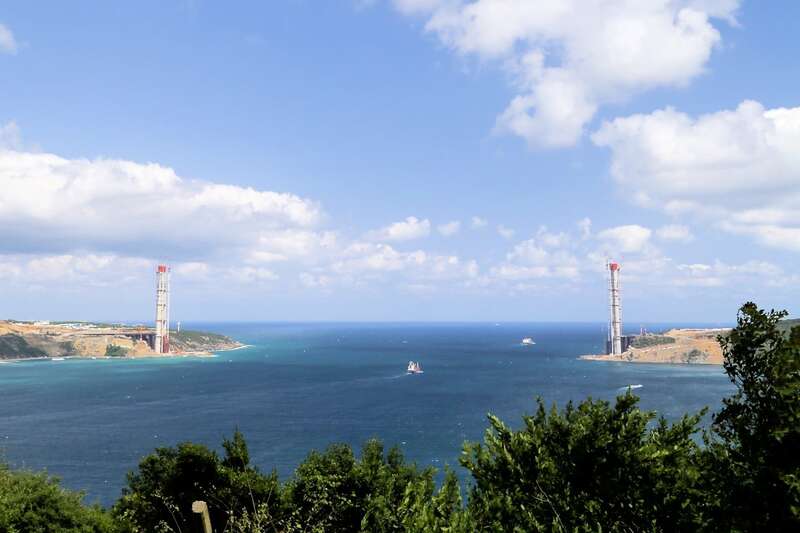 Beyond the bridge, the Black Sea. 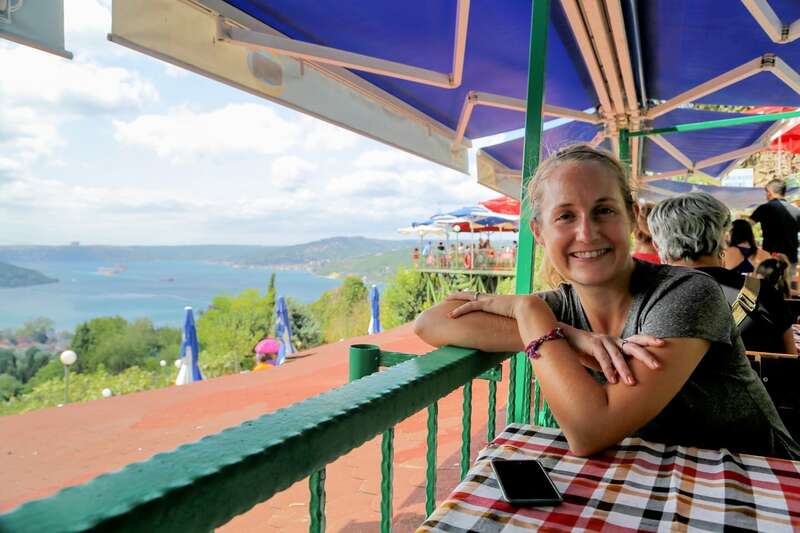 There are a number of restaurants and cafes near the pier and throughout the village, but we opted for Yoros Cafe near the fort, which came highly recommended and offered a stunning view of our route (not to be confused with Yoros Kale Kafe). We were not disappointed with the food or the scenery. 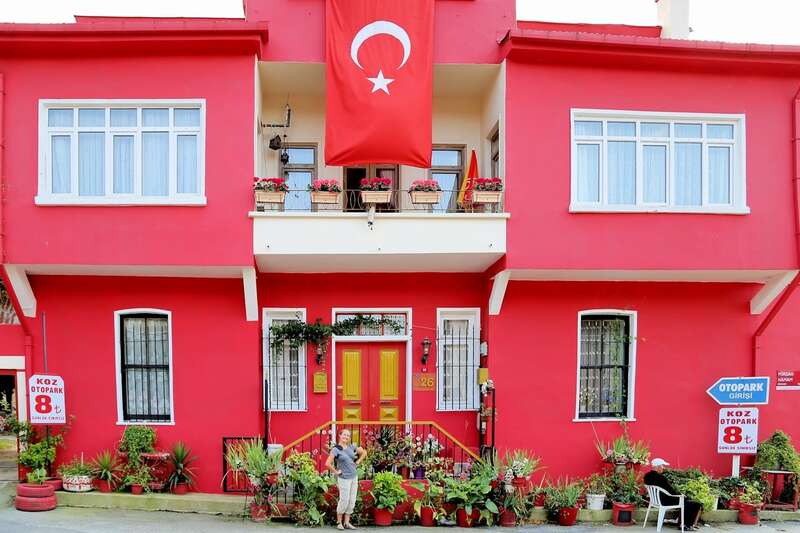 Back in the village, Lori found this very large residence painted in her favorite new color: Turkish Flag Red. 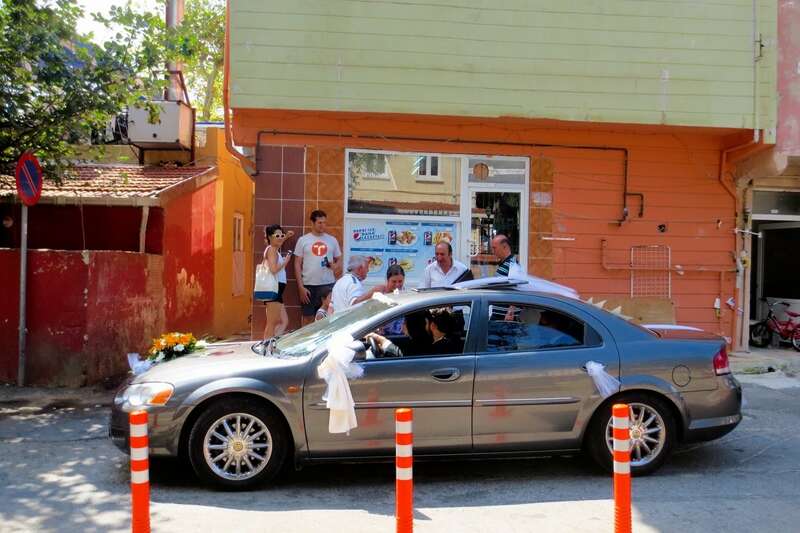 Moments later, a wedding procession cut through the narrow streets of the village, with the bride and groom stopping to chat with a friend along the way. No rush. The village was interesting enough to take a walkabout, but we were glad we took the extra time to hike up to the Yoros castle and have lunch with a view. We were able to comfortably achieve all of this in the layover time. 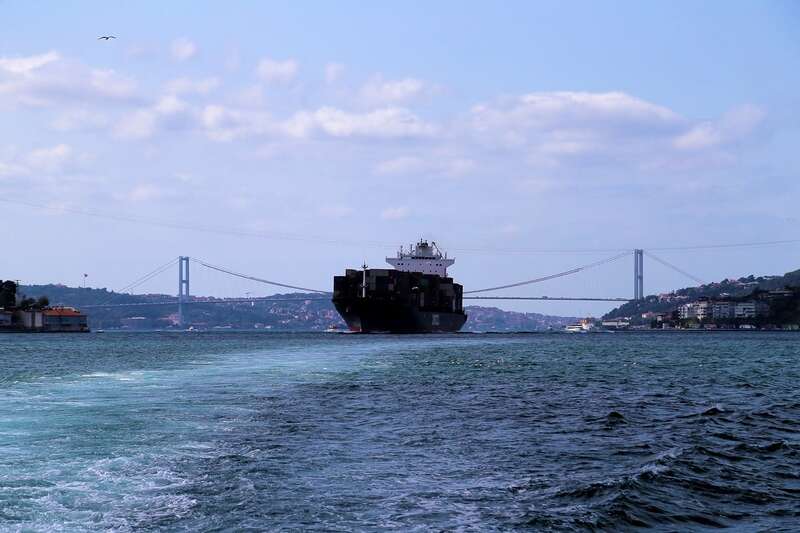 On the way back to Emononu pier in Istanbul, we hugged the Asia side with a few quick stops to let local passengers off and on along the way. 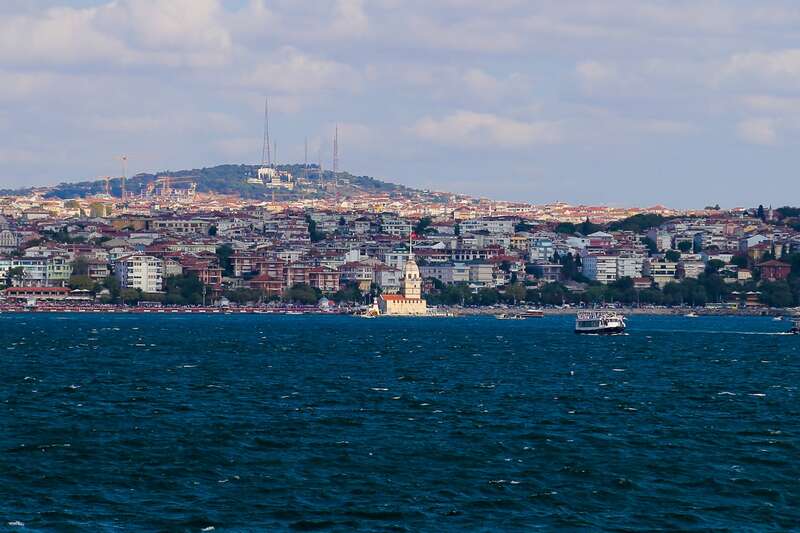 On our way back into the harbor, a sun beam dramatically lit the Maiden’s Tour on the Asian side of Istanbul. 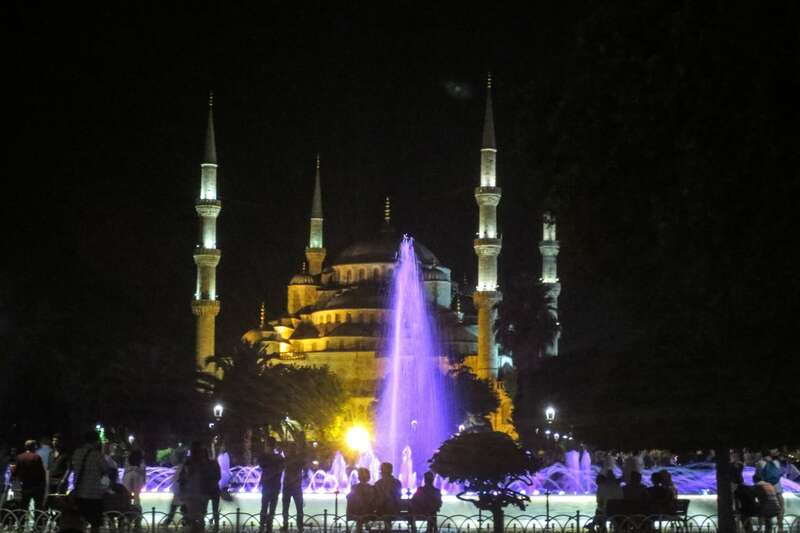 That evening, we enjoyed a perfect late-August evening in Istanbul, including a delicious meatball kebab dinner at Pasazade. Tomorrow, we hike the Land Walls! Overall, we were pretty impressed with the amenities offered by a public ferry for the price, and certainly wouldn’t have paid the additional to take a private cruise, in hindsight. We enjoyed riding along with a mix of commuters, tourists, and locals on their way to visit family/friends. The amount of time (six hours round trip with a few hours stop for lunch) was perfect. 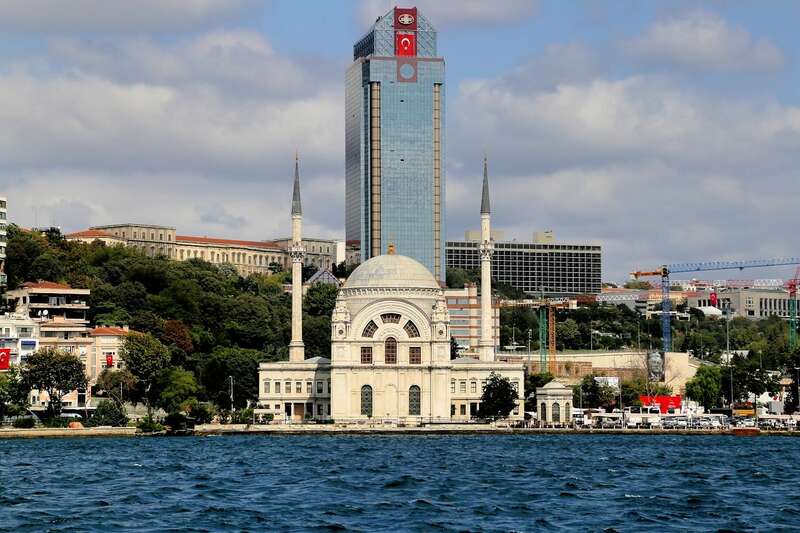 Lastly, we are so glad we budgeted time in our Istanbul visit to do the Full Circle Bosphorus cruise.